TrackerHero and Modsurfer have several things in common, not only are they both music/rhythm games but they’re also free and perhaps best of all is that they support your own Protracker modules too. I never did get around to write about TrackerHero sadly, but now that Modsurfer came out I sort of got this idea of doing a little article covering them both (if that was a good idea will be up to you guys to decide). Before I start, I have been a fan of rhythm/music & dancing games since like all the way back to when I played Parappa The Rappa (on The PlayStation One) for the first time and ever since then I have loved most Dancing games (especially DDR) but the best of the lot has to be Gitaroo Man for the PSP/PS2, really can’t find one that I like more than that (which reminds me of what I should do an article on soon!). At first glance, Modsurfer might look like a new Trailblazer game and that ain’t a bad thing for many retro gamers I guess, but it is actually not like Trailblazer at all as it is actually a lot more like the Amplitude games or yes even a bit of Guitar Hero or the likes. Gameplay mechanics are as other rhythm games out there except that here you jump from line to line to try and hit the notes with your Boingball (woohoo), if you miss a note then the song playing will play out wrong as its missing that note you just missed. In other words, the better you play the better the song will play out. 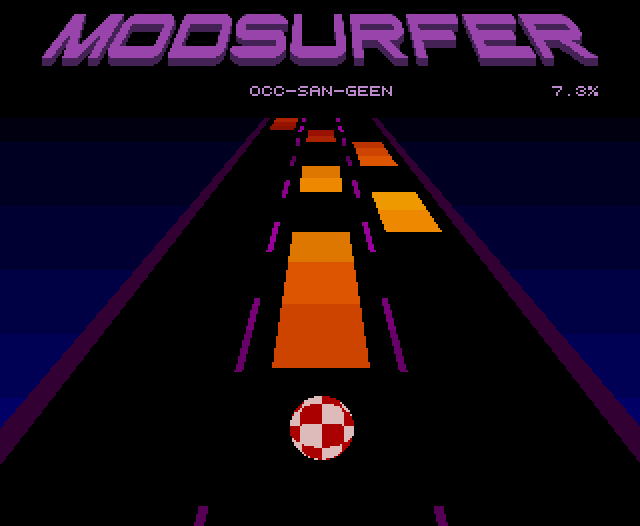 Modsurfer is based upon a PC game called Audiosurf but since I got no PC I have no idea what that actually is beyond a few videos that I just checked and well that looked a bit like a PSVita/PS4 game I reviewed ages ago. So, the neat thing about Modsurfer is that you can use your own Amiga Protracker modules and the game will adjust itself to that music by using an algorithm that generates notes on the fly and yes it works on every Amiga model out there if there’s 1MB ram in it (minimum 512kb chip ram), the only limitation lies in memory usage and size of the module you use. Modsurfer was part of a game compo and the complete source code (in assembler) is even included for those interested in such things. 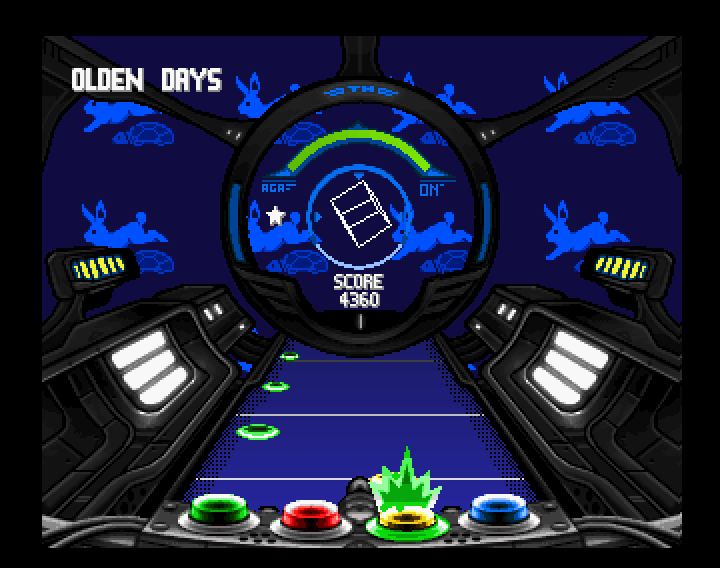 A Simplistic menu for loading songs is the only extra menu you will see in the game beyond the game screen (seen above in screenshot) which is also the “title screen”. The game screen is also very simplistic but there is a neat percentage counter (notes hit ratio) although it looks like there ain’t any tracking of scores etc beyond that. Modsurfer does what it is supposed to do in a very simplistic yet fun way, the gameplay works pretty darn good, everything feels fluid and without any hiccups on my test machine (the CD32). Feel free to check the FREE game out right now, the download link is here, there’s also some song packs on the website too. Modsurfer scores for reminding me of Trailblazer and Jump’n Roll but also for being just great fun, proper information tracking (notes hit, missed, level of difficulty (song speed) and saving stats, etc) would have been awesome and I welcome such in a future update. TrackerHero certainly owned the news feeds on social media when it was released, but was that just because it was a new Amiga game at that time when there were no other games being released at all or was it because it was a good game? TrackerHero is much more of a GuitarHero game than Modsurfer is and that is both good and bad for various reasons, it is really cool that this game for instance support using a “real” Guitar Hero guitar peripheral, instructions for how to use that is included in the game manual (and yes it does work!). Oh and yes, just like Modsurfer this one also supports normal Protracker modules which means you can add your own songs if you want to although it is more work here to add songs compared to Modsurfer as it requires you to use a tool too (included in the package), there’s also music packs available from their website (also rather good packs and well worth a try). Tracker Hero used to be an AGA only title but they went out and did an ECS version too at one point (which I never noticed before now) and while the ECS version is a downgrade in many ways over the AGA one it is still a fine game which works rather good. In this game, you have four note lanes and you don’t steer any ship or ball or whatever here as this less Amplitude and more Guitar Hero as I mentioned earlier. The silky-smooth screen refresh and whatnot from Modsurfer are nowhere to be seen here and while awesome it does feel a bit laggy and slowish compared. 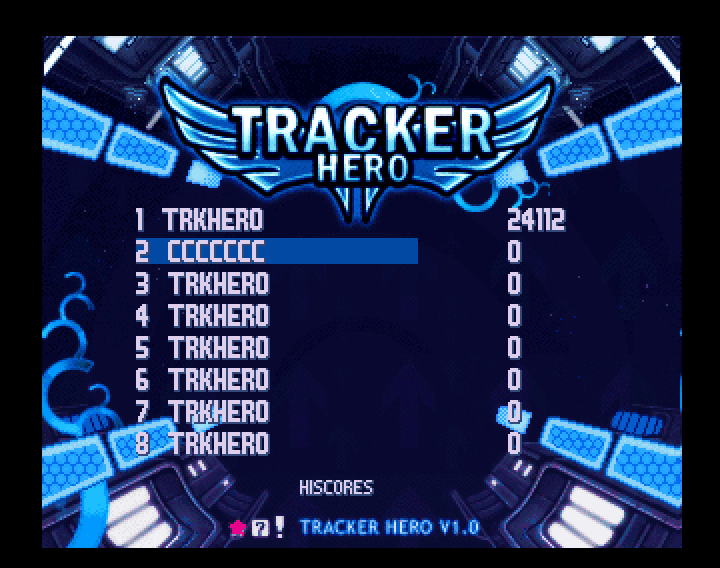 TrackerHero saw a lot of updates after the initial release and many of the features were most likely added because of user feedback and such and therefore this is naturally a more complete product with stats, save features, high score lists, NTSC mode support and so on. TrackerHero also supports the PS2 Dance mat (mine is from a Dance Dance Revolution bundle), yes I kid you not and guess what, it works really good and jolly good fun too. 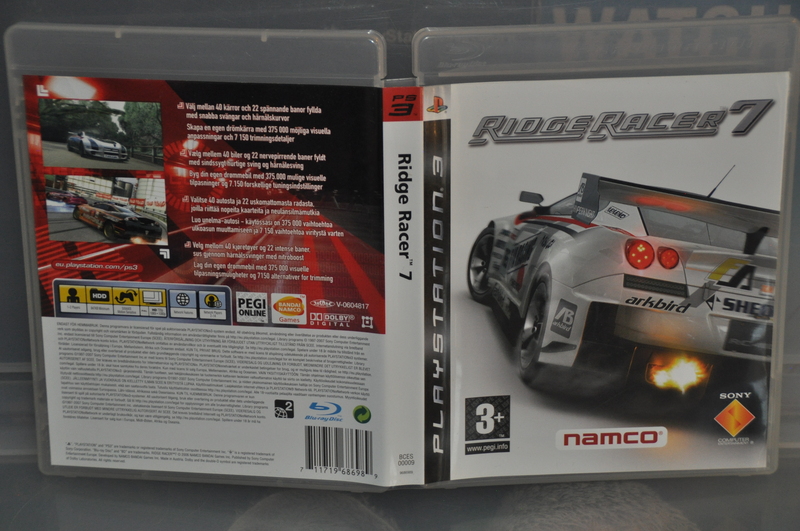 You can download the full game (and trackpacks) at their website or on Aminet, free of charge of course. TrackerHero is a solid Amiga version of Guitar Hero and it is full of functions and whatnot to make it a full-blown rhythm game, the support for PlayStation 2 peripherals is an excellent idea and well implemented with little DIY and try and fail experience needed. The graphics are good but it does feel slower than it should be, the style and commercial feel to the game is good and I could easily have mistaken this title for a commercial game for sure. So, is TrackerHero better than Modsurfer or not? , well, they are both similar but very different games and I’d say that you just have to give both a go as they complete each other. Both games are also very similar to all Harmonix’s music games Amplitude and Guitar Hero/Rockband which in itself is nothing less of an awesome thing for us to say that “yes I can do that on the Amiga too” in this day and age. 10/10 for the effort to both Amiga products. PS: Thanks to IndieRetroNews and HallOfLight for additional screenshots, you guys saved the day again!